Scientists at Northwestern University are literally reshaping the world of graphene. 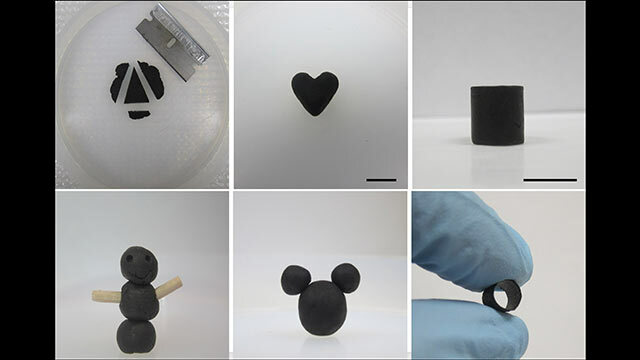 They have turned GO (graphene oxide) into a soft, kneadable and moldable play dough. You can shape it and then reshape it into free-standing, 3D structures. They call it GO Dough. Even though the dough is lots of fun to play with, it is not just a toy. It solves many long-standing – and even explosive – problems for companies that manufacture, deliver, store, and use graphene. The researchers wrote about their work in the prestigious journal Nature Communications (citation below). The authors were Che-Ning Yeh, Haiyue Huang, Alane Tarianna O. Lim, Ren-Huai Jhang, Chun-Hu Chen, and Jiaxing Huang. They are all from Northwestern University. Prof. Huang recounted his most recent shipment of graphene oxide. 5 kg of graphene oxide was dispersed in 500 liters of liquid. It had to be delivered in a truck, he explained. Graphene oxide is a product of graphite oxidation. Scientists often use graphene oxide to make graphene. Graphene, a single-atom-layer sheet of carbon, is the world’s strongest material. It is also the world’s lightest material. The researchers made GO Dough by mixing water with an ultra-high concentration of graphene oxide. If the scientists had used binding additives, they would have had to process the material further to remove these additives to return the graphene oxide to its pure form. After shaping GO Dough into structures, it can be converted into dense solids which are chemically stable. They are also electrically conductive and mechanically hard. If you want to transform it into a high-quality GO dispersion, simply add more water. “Binder-free graphene oxide doughs,” Che-Ning Yeh, Haiyue Huang, Alane Tarianna O. Lim, Ren-Huai Jhang, Chun-Hu Chen, and Jiaxing Huang. Nature Communications, Volume 10, Article number: 422 (2019). DOI: https://doi.org/10.1038/s41467-019-08389-6.